If you are under a certain age and don’t have access to a retro arcade club, there’s a good chance that you’ve never even seen a true pinball table out in the wild. Sure, there are a few out there, somewhere in the odd themed restaurant or bar – probably heavily worn but still screaming to be played with. It’s a shame how much of a dying breed they have become overall, especially as we advance forth into this accelerated, technological age. Of course, there are amusement arcades that you can venture to, a place that once saw home to the ball bearing-slinging contraption. Unfortunately, though, these are now tailored as soulless machines spewing tickets that you can exchange for equivalently overpriced bouncy balls. In fact, you would be lucky to even find a cabinet with an arcade stick, let alone an actual pinball table. So it’s great to see that there are those who want to keep the pinball spirit alive under a realistic budget. As it turns out there’s not just one, but two titles out for the Nintendo Switch. Both of which saw a release at the same time and falling perfectly in line with the competitive nature that these boxes of springs, bells and whistles originate from. Unlike Pinball FX3 (the other pinball game to be released on Switch) Stern Pinball Arcade keeps a more pragmatic approach in its design. Each table is accurately replicated to resemble some of their more famous real-world pinball machines. While these would cost you a pretty penny online to obtain for a man cave (we’re talking four to ten grand) this free-to-download title grants you the ability to buy up to ten simulated tables to smash a chrome ball around in. There are actually eleven tables in total. The Frankenstein table (which is based on the dreadful Robert De Niro movie) is unlocked for free when you download the title from the Nintendo eShop, so you can at least get the ball rolling and try it out for yourself. If you do decide to build a collection of tables, however, you have the option to buy them individually or in two separate packages. The single tables do cost a bit more than you will find with Pinball FX3, but again, they are reconstructions of Stern’s real-life counterparts. There’s also the option to buy a physical copy with everything on the game card and possibly for a cheaper price. While these tables are true digital replicas of the original, the visuals do look quite bog standard. There aren’t a lot of textures or dynamic lighting effects to show any real depth to really give you a true feeling that you are playing one of Stern’s classics. It’s clearly evident that it is tailored to flexibly translate to anything including lower-end Android devices, and it would have been nice to see just a bit more effort put into the polish of the graphics as the Switch can clearly handle it. In regards to the longevity of Stern Pinball Arcade, as it stands at present there are no online leaderboards available. This obviously restricts the experience a great deal, especially if you want to compete with mates who don’t happen to live nearby. The lack of this crucial fundamental feature shows signs that FarSight Studios may have rushed this compilation onto the Switch. However, we have recently been informed an update to this feature will be implemented in the next patch. That’s not to say that Stern Pinball Arcade isn’t any good though. The gameplay runs at a smooth 60fps regardless of how you choose to play it and the ball physics overall feel pretty solid. It’s not quite as heavy as a real pinball mind, but solid enough to give you a sense of weight. The fact that these are based on real tables allows you to learn their unique features quite easily due to how small the tables are in comparison to Pinball FX3. Tables such as Ripley’s: Believe It Or Not, for example, are a good starting point for beginners, with angles easy enough to hit up ramps as well as being one of the more interesting machines in the collection. When it comes to deciding what tables to purchase really depends on taste. The one that seems more attractive based on nostalgia may not necessarily be the one that you favour most. Take the Ghostbusters table that, while I do enjoy it a lot, some may find it to be one of the more challenging ones in the package. With no way of testing a table before buying, it means that you are blindly choosing when purchasing one individually. In saying that, a single table can last you a while if you decide to explore it enough. You can either learn its rules for yourself or there’s a handy in-depth instruction manual with each machine. There’s also information on the table’s history along with a cool retro-style flyer to examine, although its tiny text is quite low-res and difficult to read even when zoomed in. If you do decide to get all eleven, there is a Challenge mode where you have three credits in conjunction with the set table’s lives in order to try and hit landmark scores to move on to the next machine. While this is a great little addition, the inability to save your progress can make it all feel a bit of a grind. Regardless of whether you get the whole package or not though, every table has five of their own individual missions to complete. Again, while this is also a great feature, you could probably complete most of them in just a few goes. 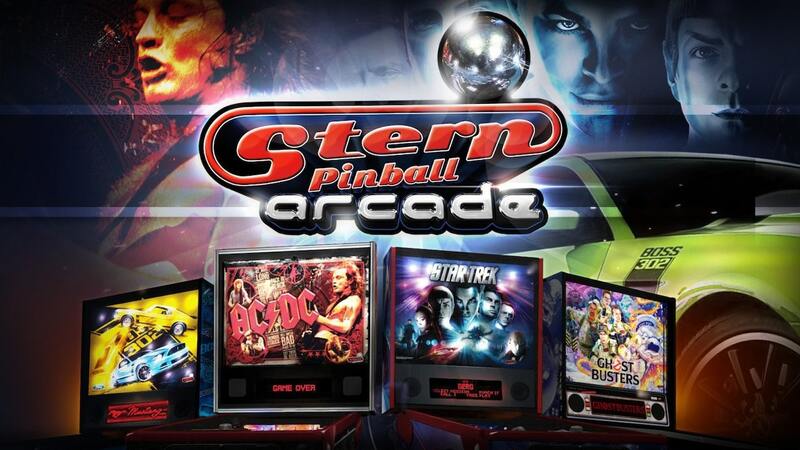 The audio in Stern Pinball Arcade aims to recreate an arcade feel to the experience. While it does a fairly decent enough job to try and draw you into such an atmosphere, the sounds can feel a bit unbalanced when working together. Everything sounds muffled, and sound effects can get drowned out by the music. It would have been better if there was an option to change the sound’s atmosphere to balance it out a bit. There are options to toggle volume rockers, it just never sounds quite right however way you try to tune it. The camera could also do with a bit of a tweaking too. There are four angles to set it at, but the space around the table seems more dominant with most of them. FarSight studios did let us know that a TATE mode option will eventually be available to those who want to stand their Switch screen in a portrait format. All in all, Stern Pinball Arcade is a decent pinball package. While its presentation and visuals are quite lacklustre compared to Pinball FX3, the recreations themselves are decent enough to have fun with. There’s plenty of hours to kill depending on your approach to the format, and future plans to update some of the more important issues could eventually strengthen the overall experience. It’s definitely worth a download, even if it is just to take advantage of the free table. Whether you decide to dive into it further, is entirely up to you.